I hope everyone is enjoying their summer evenings with family and friends. I know I am. 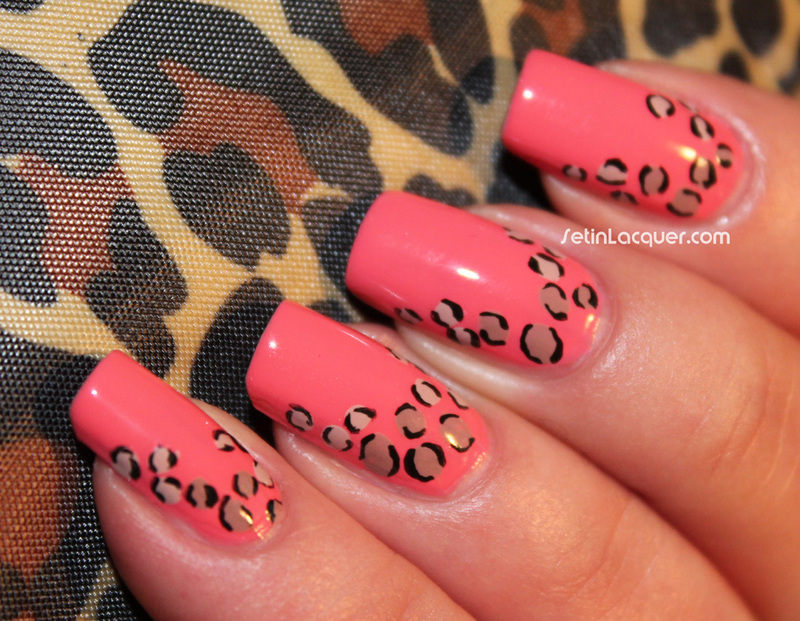 This fun leopard nail art is easy. 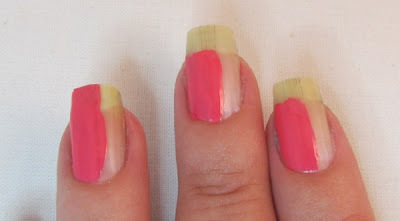 I had on a base coat of Orly Pixy Stix and didn't want to start from scratch. So I decided to add leopard spots to it. I didn't want too many spots so I just used a lower corner of my nails to anchor my starting point. I used acrylic paint to create the spots. I started with a tan color in the very corner and made it lighter as I came up the top of the nails. Then I used black acrylic paint to create the detail. Of course I used my MASH Nails brushes. I like how they came out. I haven't been able to do much nail art lately and I have missed it. Question for you though... Am I the only one who holds my breath when I do nail art? I have to keep reminding myself to breathe. And I arch my right foot. 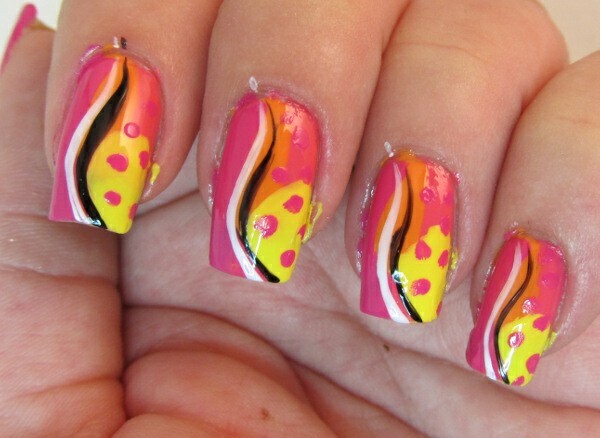 What is your quirk when you create nail art? 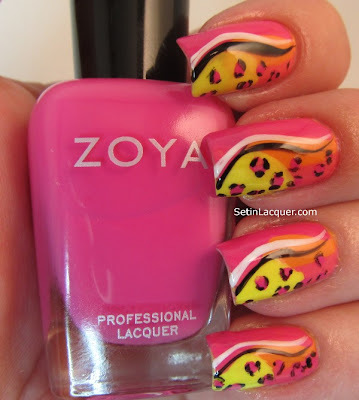 Earlier this summer I posted a neon leopard mani that I just loved. So I decided to try it using Fall colors. I used Zoya Monica, Cynthia, Natty and Evie for this nail art. I also used a black and white striper polish. I am not going to go through the steps here. You can use the same step by step tutorial that I posted for the neon leopard mani. It's the same technique. I love Zoya polishes. 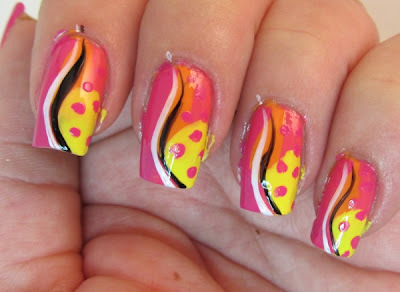 They are great alone or for nail art. Zoya can be purchased at zoya.com for $8 each. I saw an awesome mani online that I just had to try. However it had rhinestones and beads. And while I love the look of rhinestones and beads I don't like them on my nails. It's just my preference. I don't like the feel of it on my fingers. 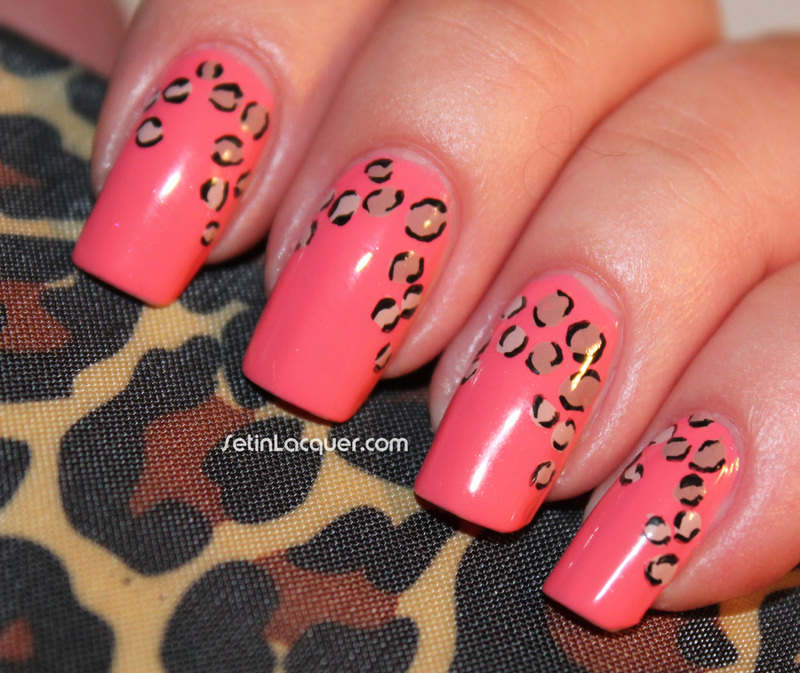 So I took the steps of this leopard print mani by Love4Nails and left off the rhinestones and beads. It really is quite easy although it is time consuming. I used Zoya Lo, Whitney, Arizona and Creamy for the base colors. Zoya Raven was also used for the black on the leopard's spots. The black and white stripes were made just using striper polishes. So here's a step by step guide on how it was done. I started with a base coat to protect my nails. Then I painted one corner of my nail with Zoya Lo. On one of them I went too far up. If you do that don't worry. Nothing in these steps has to be perfect. I let that dry and then applied the Zoya Arizona. Again, it doesn't have to be perfect. I overlapped the pink with the orange. Then I applied Zoya Creamy to the outside tip. I forgot to get a photo of this step. But you get the idea. After that I used Zoya Whitney in a curve over the orange and up one side of the nail - overlapping the yellow. Then using a striping polish I placed a stripe of black in a curve along the center of the nail and then applied a white stripe right next to it. Using Zoya Whitney and a small tipped art brush I made dots and swiggles along on the yellow and down the side. I say "swiggles" because I think perfect dots don't look quite right for the leopard spots. After that I used the same small tipped brush and applied black around the pink "swiggles." Don't completely paint a circle around them. Just outline parts of the "swiggles." 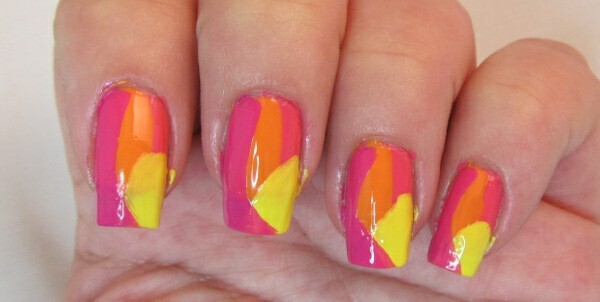 Let it dry and apply a good top coat. I use Seche Vite fast dry. It helps it dry quickly and it doesn't smear the design. And this is the completed manicure. I may keep this one on for a few days.